This book will not only make you laugh; more significantly, it will make you think. When the Jews of Eastern Europe came to the United States in the 19th century, they brought with them their own special humor. Developed in response to the dissonant reality of their lives, their self-critical humor served as a source of salvation, enabling them to endure a painful history with a sense of power. In America, the marginal status of immigrant Jews prompted them to use humor a a defense, exaggerating or mocking their ethnicity as events dictated. 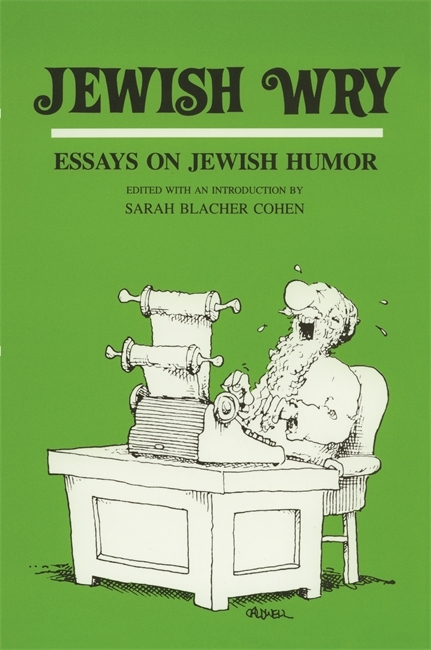 Jewish Wry examines the development of Jewish humor in a series of essays on topics that range from Sholom Aleichem's humor to Jewish comediennes through to the humor of Philip Roth. This important book offers enjoyable reading as well as a significant and scholarly contribution to the field. Sarah Blacher Cohen is professor of English at The State University of New York at Albany. She is the author of Saul Bellow’s Enigmatic Laughter and editor of Comic Releif and From Hester to Hollywood. [Jewish Wry] maintains its balance of fun and erudition both by thoughtful definitions of Jewish humor and by unique and compelling insights into its mechanisms and functions. Sarah Blacher Cohen . . . has done it again . . . This is an extraordinarily rich book. It can be read and it can be studied. In its way it is a classic pillar of the Jewish experience in America.